Diego Velázquez was originally from the southern Spanish city of Seville. Though he began his career painting genre scenes (images of everyday life) that were often redolent with religious undertones, in 1623 he was ordered to paint a portrait of King Philip IV. Although unfortunately now lost, that portrait secured his future and he was named official painter to the king, a position he served until his death. Although he created many portraits of members of the royal family, Las Meninas is by far his most famous and technically brilliant work. Just one year before his death in 1659, he received the Knighthood of Santiago, an honor he yearned for his entire life (during this time artists were generally not permitted to ascend to noble rank by the mere fact that they worked with their hands). Seville was once the largest city in Spain, with a population of around 130,000 people—quite a large population for early modern Europe. It was also the most culturally diverse city in Spain. 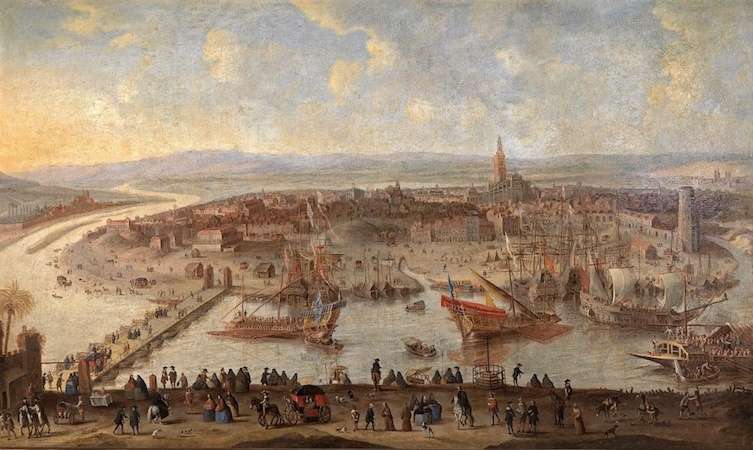 As a port city (see the image above) Seville was the main hub for trade between Europe and the Americas. Merchants from across the continent frequented the city, bringing with them artworks and other fine commodities. Wealth poured into Seville and some even remarked that the city was so wealthy that the streets could be paved with silver and precious gems. 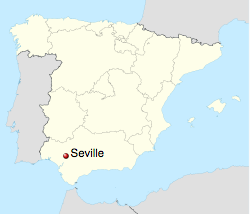 Map showing the location of Seville in Spain. While on the surface there was much to admire about this cosmopolitan city, there were also the common realities that come with large cities. Harsh distinctions in social class left a minority of wealthy people surrounded by a desperate group of impoverished citizens. In addition, Seville was a stop along the slave trade route and most middle and upper-class citizens in Seville owned slaves. 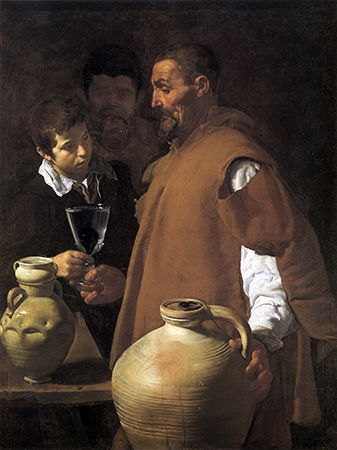 The painting, The Waterseller of Seville is often labeled as a bodegón. Derived from the word bodega, which means tavern in Spanish, bodegón was a term used to describe artistic representations of daily life, and particularly those associated with food. Essentially these are genre scenes with still life objects. Velázquez certainly was not the first artist to paint bodegones. 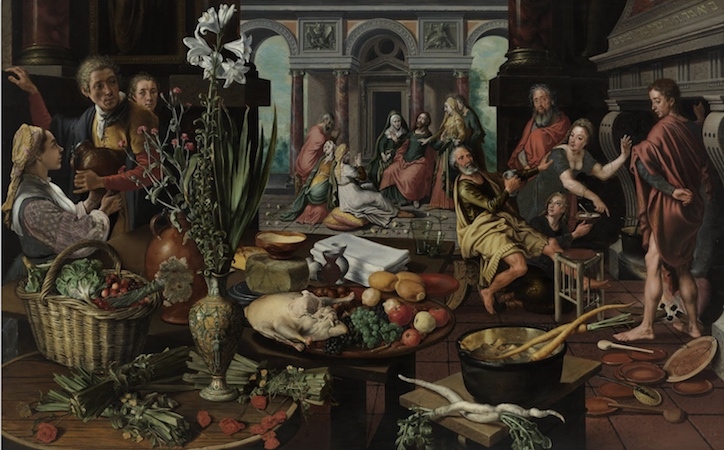 By the time he painted The Waterseller of Seville, Netherlandish artists such as Pieter Aertsen had already established themselves as masters of still life and genre painting (see below). The movement was also gaining momentum in Italy where Caravaggio and others explored ordinary people in ordinary places. There were even some Spanish painters whose still lifes and kitchen scenes had tremendous influence on Velázquez. Velázquez departed from these other works by making his compositions more simple—pared down to only a few figures and objects. As a fairly new genre relatively speaking, Velázquez’s bodegones were not well-received by some traditional artists. Despite these reservations, there were many other artists and patrons who were fascinated with genre scenes and Velázquez found a market for his works. With their earthly color palettes, dramatic lighting and understated backgrounds, these works reveal the influence of Caravaggio. 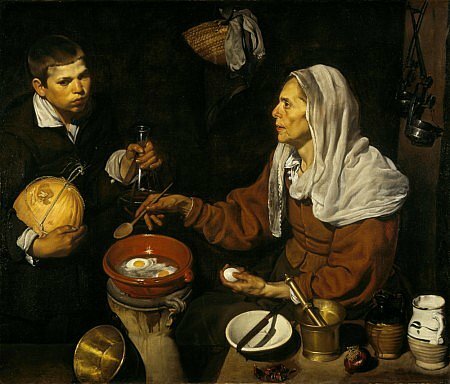 Set in kitchens or taverns, the bodegones portray the simple nature of daily life and demonstrate a naturalism and verisimilitude that was unparalleled by Velázquez’s contemporaries. In the center of the compacted composition stands the monumental profile figure of the Waterseller, aged from the hot sun and donned in a humble brown cloak. He offers a boy a glass of water, freshened by a fig, which he has just poured from the large clay vessel in the immediate foreground. 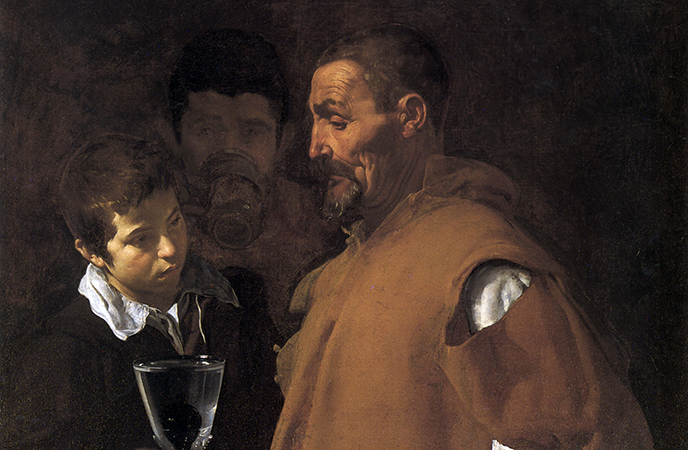 Although they are physically connected to one another as they both hold the glass, the boy and old man do not make eye contact but instead stare past one another. Perhaps their difference in age prevents a connection between the two, or perhaps it is their difference in social status. The face of a young man emerges from the shadows of the background between the old Waterseller and the boy. He stares out at the viewer while drinking from his mug. Within this painting we see three ages of man represented. While Velázquez has dismissed any background details in favor of the figures in the foreground, we can assume by the objects that this scene is taking place inside or near a tavern. The light coming from the left not only illuminates the face of the young boy, but also draws attention to the beads of water trickling down the slightly misshapen curve of the water vessel. This painting is a tour de force of naturalism; the textures of the clothes, jugs, glass, and even the waterseller’s face are meticulously rendered using a combination of thick and tiny dabs of paint. 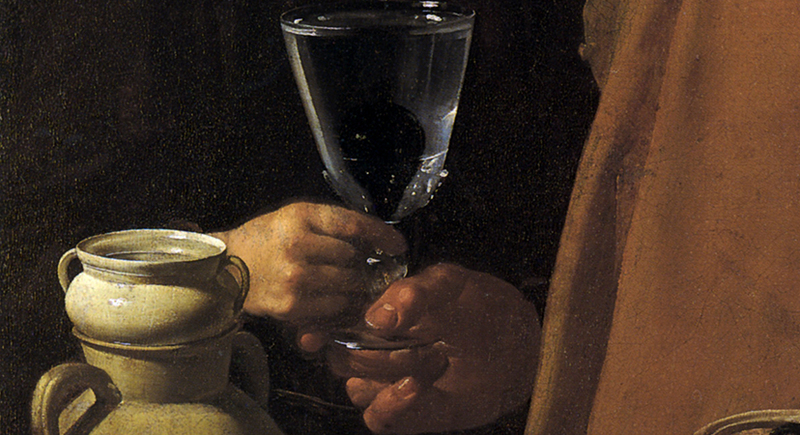 The naturalism is as much the subject of the work as the Waterseller himself. Although watersellers were a common feature in any urban landscape of early modern Europe, they were especially prevalent in Seville, known for its long and brutal summers. As marginalized figures, contemporary literature and imagery often represented watersellers as beggars or cheats who routinely fought with their customers. 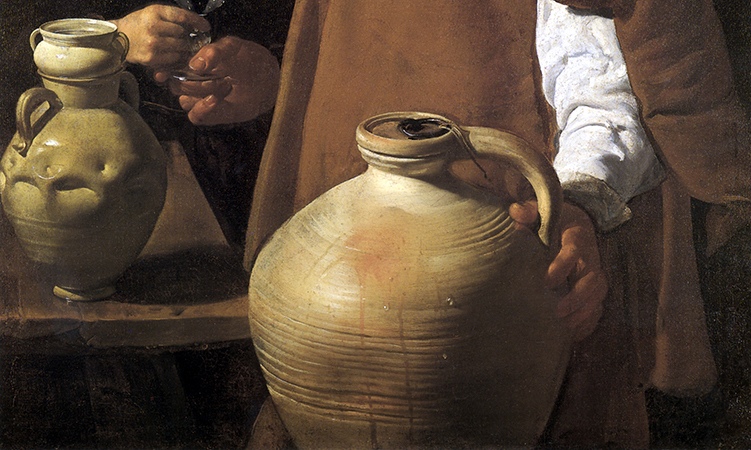 However, in Velázquez’s depiction, there is nothing of the scoundrel type that one would expect from a waterseller. Some have argued that this is an idealized representation that does not depict the true nature of this impoverished class—a class that was growing ever larger during this time. Others argue that this painting is not concealing the harsh realities of poverty, but rather imbues this waterseller with both monumentality and dignity. 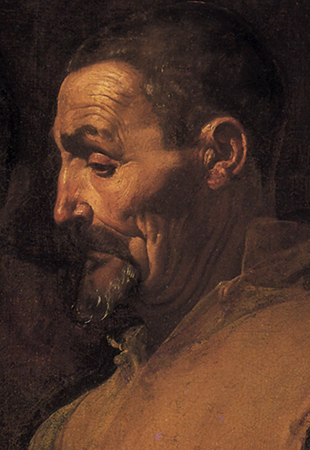 Jonathan Brown, Collected Writings on Velázquez (New Haven: Yale University Press, 2008). Jonathan Brown and Carmen Garrido, Velázquez: The Technique of Genius (New Haven: Yale University Press, 1998). Tanya J. Diego Tiffany, Velázquez’s Early Paintings and the Culture of Seventeenth-Century Seville (University Park: The Pennsylvania State Univesrity Press, 2012). Barry Wind, Velázquez’s Bodegones: A Study in Seventeenth-century Spanish Genre Painting (Fairfax: The George Mason University Press, 1987). Cite this page as: Olivia Nicole Miller, "Diego Velázquez, The Waterseller of Seville," in Smarthistory, August 8, 2015, accessed April 24, 2019, https://smarthistory.org/velazquez-the-waterseller-of-seville/.